ATENEO ended its five-year title drought with an 88-86 win over archrival La Salle in Game Three of the UAAP Season 80 men’s basketball tournament on Sunday at the Smart-Araneta Coliseum. 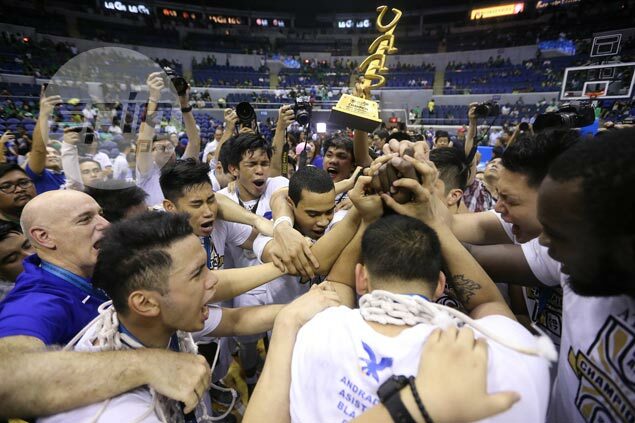 The Blue Eagles returned to the top of the UAAP since winning their fifth straight title in 2012. Ateneo also averted a major collapse in a season that saw the Eagles win their first 13 games. After a major meltdown in Game Two on Wednesday that saw its 21-point lead slip away, the Blue Eagles came up with a 10-point lead in the first half, allowed the Archers to claw back but managed to regain control in the end. Ateneo also kept its composure in the fourth with Thirdy Ravena and Matt Nieto leading a huge run to dethrone La Salle. With the game tied at 68, Ravena skied for a huge offensive rebound and kicked the ball out to Nieto, who drilled a three to break the deadlock. That turned out to be the tonic Ateneo needed as they went on a 14-2 blast to break away. Isaac Go staved off a last stand by La Salle as the Ateneo big man hit a triple with 24.7 seconds left in the fourth to give the Blue Eagles an 85-80 lead. Ravena was named Finals Most Valuable Player after finishing Game Three with 17 points, eight rebounds, five assists, three steals, and one block for the Blue Eagles. Matt Nieto had 14 points, while Chibueze Ikeh, playing in his final game as an Ateneo cager had 12 points, 13 rebounds and two blocks. Ikeh along with other graduating players Vince Tolentino and Kris Porter hugged each other after their final game in a Blue Eagles uniform ended with a UAAP championship. After posting a 24-14 lead at the end of the first quarter, Ateneo looked headed for another collapse as La Salle slowly clawed its way back in the game and led, 62-59. At the end of the third, the game was tied at 69. But Ateneo rallied for an 80-70 lead, with Tolentino capping off that 14-2 turnaround with a lay-up over Prince Rivero. Two-time UAAP Most Valuable Player Ben Mbala had 19 points, 14 rebounds and three blocks for the Green Archers, Aljun Melecio had 16 points and Ricci Rivero added 14. Ateneo 88 - Ravena 17, Ma. Nieto 14, Ikeh 12, Asistio 11, Tolentino 9, Go 7, Verano 6, Mendoza 5, Black 4, Mamuyac 3, Mi. Nieto 0. La Salle 86 - Mbala 19, Melecio 16, Ri. Rivero 14, Caracut 13, Santillan 11, Tratter 4, Montalbo 3, Go 3, P. Rivero 2, Tero 1, Baltazar 0. Quarterscores: 24-14; 45-38; 66-66; 88-86.